One of my co-workers was telling us about the seven [!!!] themed Christmas trees that she puts up each year. She reports that it takes her two weeks to get them all up and three weeks, after the holidays, to get them all taken down and put away. Yikes! I can think of so many, many things I would rather do with that time. I do decorate. 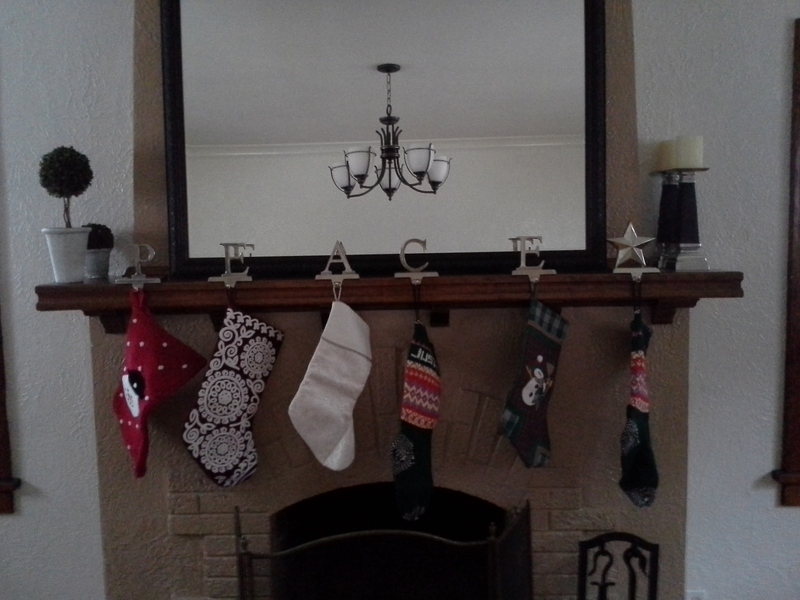 I put up the stockings. Same stockings we have used for years. 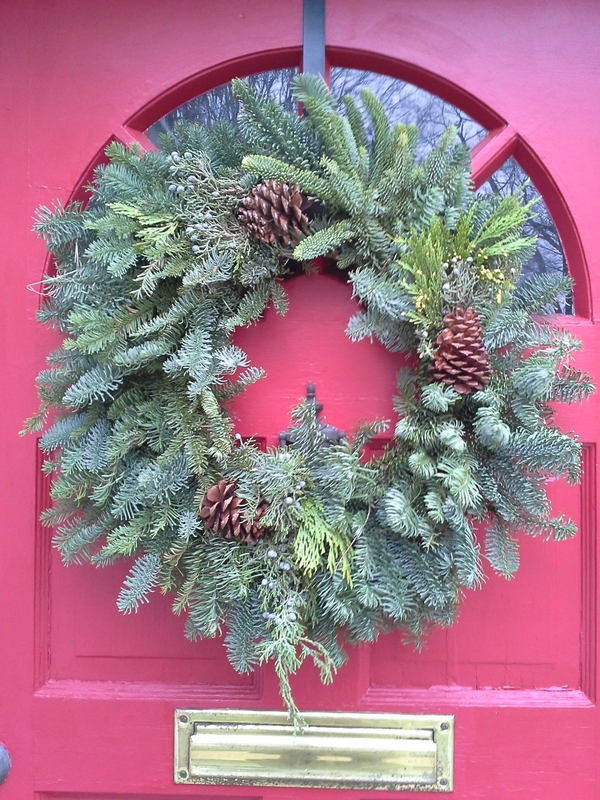 And a fresh wreath on the front door. It took me one minute, fifteen seconds, [middle son timed me] and cost $15. My kind of holiday cheer. 1) My absolute favorite gift to give and receive is time together. Consider tickets to an activity you both enjoy like a sports event, a play or a trans-continental train ride. A trip to Europe would be welcome. Once, I gifted my father tickets to the Glen Miller Orchestra (a favorite of his youth.) Mom, dad and I attended the concert together. I have seen my father cry just twice in his lifetime. On the day his mother died, and when he was thanking me for the gift of the concert. 2) Consumables: Sure, chocolate, wine and cheese are good. But how about postcards and stamps? Crossword puzzle books? Handmade soap? Firewood? Decorations made from nature that will decompose, like flowers, pumpkins, ivy, pinecones, etc. I knew a woman who loved to grow flowers. She collected vases from friends and thrift shops. All summer long she created beautiful floral arrangements and delivered them to the local nursing homes. 3) Purchase digital services like I-tunes or Shutterfly. 4) Photos (print or digital) of your loved one’s family. Preferably ones they could not easily get themselves like antique family photos that you have copied for the whole family or candid snapshots of your nieces and nephews when you have them for a sleepover. 5) A gift to a charity that you both admire. The Red Cross. The Heifer Project. Habitat for Humanity. Physicians Without Borders. You get the idea. 6) A gift of service. Cleaning out the gutters of an elderly homeowner. Babysitting for new parents. Use of your guest bedroom, if you live in a place people like to visit. If you have a talent like photography or baking the most amazing treats, you can offer to do that for a special occasion. We are limited only by our lack of imagination. Every successful minimalist knows that it’s not just one big declutter and then you are done. Keeping stuff out of your dwelling space requires vigilance and multiple strategies. Donating to charities, garage sales and asking loved ones not to buy you stuff are all excellent strategies. As is re-gifting. There is to be no shame in it, if done right. 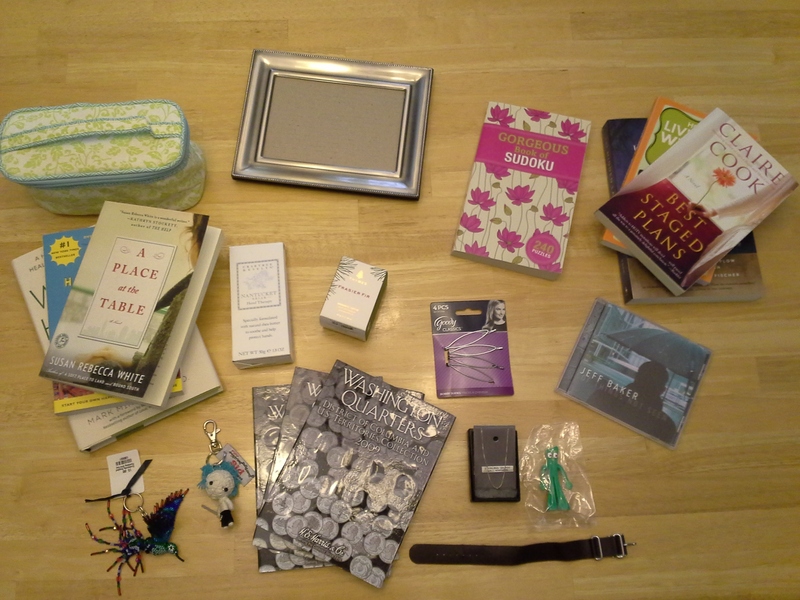 Here’s some stuff I have been collecting for the past year to re-gift at Christmas. 1) Never, ever, ever give the gift back to the person who gave it to you. Ever. If you don’t trust your memory, put a note with the item reminding you who gave it to you. 2) If at all possible, leave the original packaging and tags on it. 3) The gift needs to match the person. Don’t give a Christian music CD to an atheist or a leather belt to a vegan. The goal is not to just get rid of stuff (if that is the goal, just donate the item to charity) but to find a home for the item where it will be loved and used. 4) Don’t re-gift to someone who is offended by the concept. 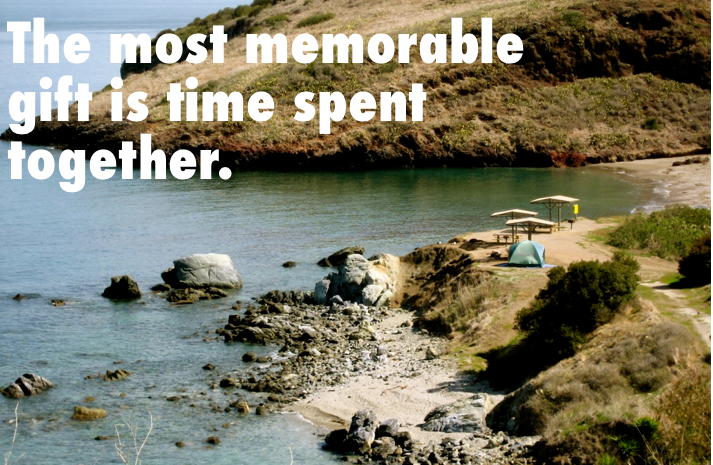 Now go out there and have some simple, frugal, minimalist fun. I’ve been working very hard on a Christmas gift for my daughter. Don’t tell her what it is. 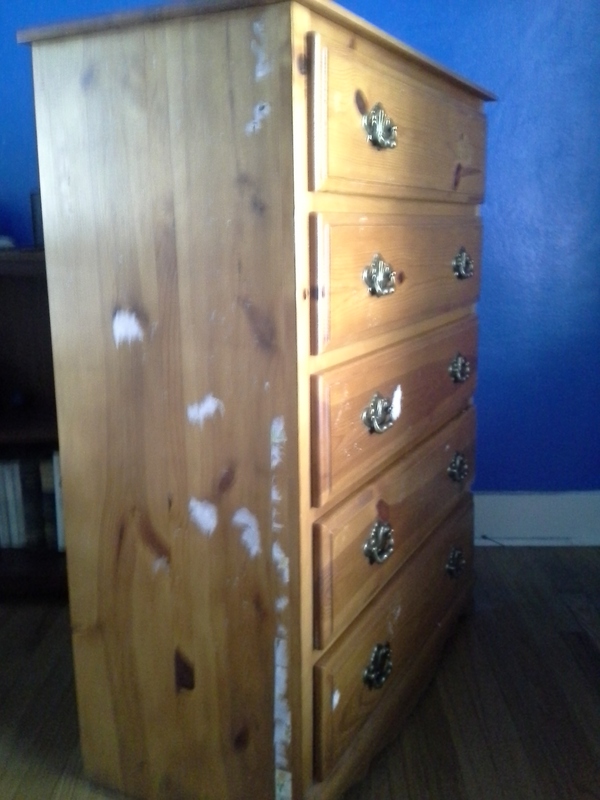 She has a chest of drawers, that has been hers since she was about 6 months old. She never liked the color, and as a child covered it with stickers. C.O.V.E.R.E.D. 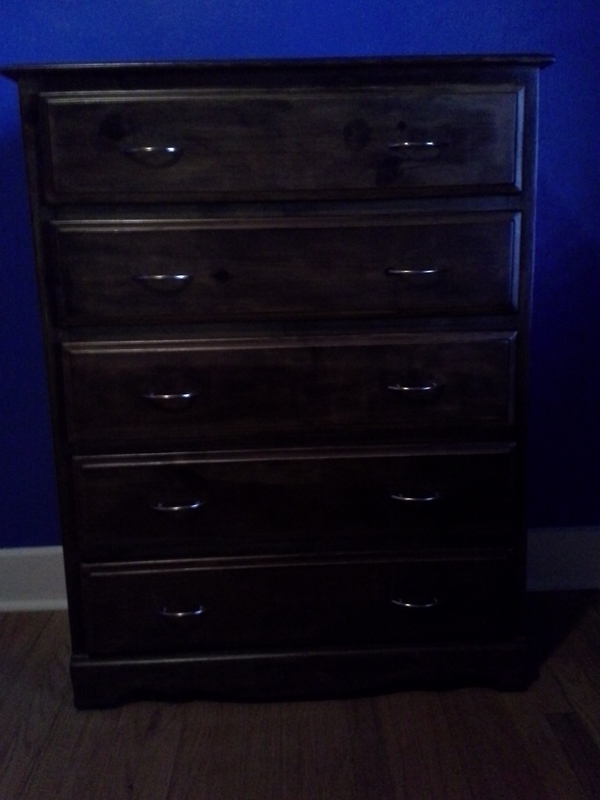 For her gift, I have refinished it. I wish I had a photo for you, before the stickers came off, but I don’t. Here’s one with most of the stickers removed. 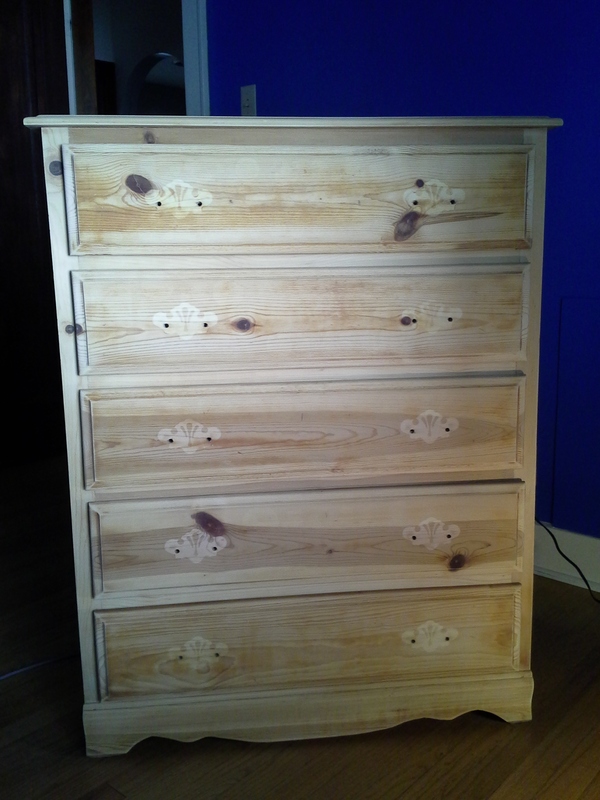 Then I stripped it and sanded it. And here it is with the darker finish that beloved daughter prefers and some new hardware. 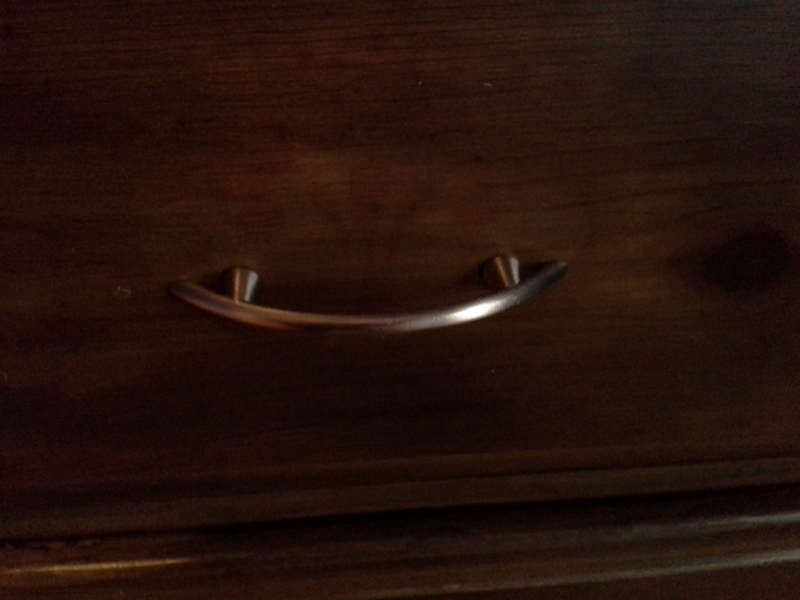 Close up of the new drawer pulls.